Winners in Hereford in Bloom! Back in April, when it seemed like the longest winter would never end, we started dreaming of long hot summer days and began planning for Hereford in Bloom. 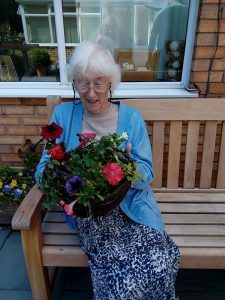 We considered entering last year as our residents always love the garden so much. This year was definitely going to be the year! 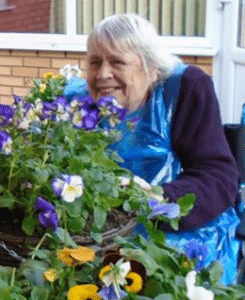 We have many green fingered residents at Newstead and everyone was keen to get involved. 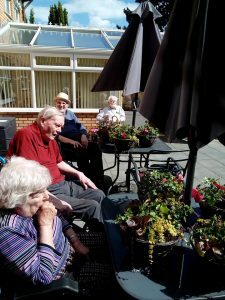 We shopped for bedding plants together from the local garden centre and made sure every residents favourite blooms were included in the scheme. 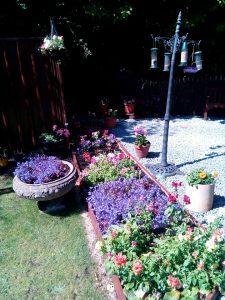 In May, we began planting the beds and hanging baskets. We lost count at 11!! Feeling hopeful, our activities coordinator, Vanda, submitted our entry on 13 June. Green fingers crossed! 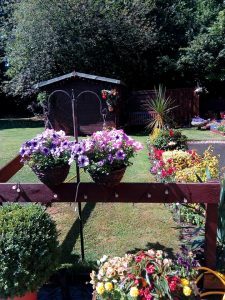 Judging was early July, with results announced at Radway Garden Centre on 13 July. We won 5th place! A fantastic achievement, particularly considering we were up against some very strong competition. A huge congratulations to all the residents and staff. It is so lovely to see all your efforts rewarded and recognised across the county. What a summer of sport it has been. 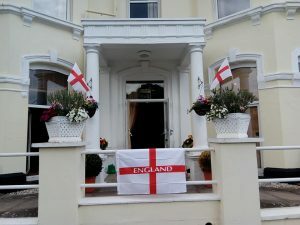 We were right behind our England team and our residents all agree that they did us proud. We were flying the flags for England and joined the nation in some nail biting TV viewing! Leah also put us through our paces with footie themed exercise routines. 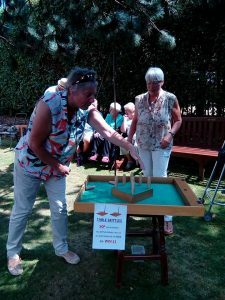 Her ball skills chair exercises had lots of residents very enthusiastically participating. We welcomed families, friends and the local community to our summer fete on Saturday 14th July. A wonderful opportunity to showcase our gardens too. 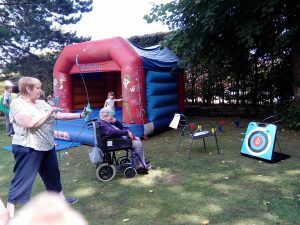 There was a bottle stall, tombola, cake stall, strawberry teas, a BBQ, table skittles, archery, face painting and a bouncy castle. Something for all ages. We even had a visit from West Mercia Police with their police car – much to the delight of the little ones. Thank you to all our staff and residents and to everyone who supported the day. 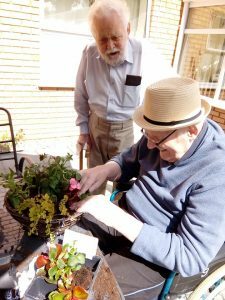 We raised a fantastic £511 for our Residents’ Fund.